Is anyone else giddy with excitement about the fact that fall is finally here!? In case you can’t already tell, fall is my favorite season. Yea, winter, summer and spring are great, but no other time of the year can compare to fall in my opinion. And, you can’t go through fall without hearing these two words: pumpkin spice. I love fall and I love pumpkin… needless to say I’m totally in my element once September hits! I mean, what’s better that sipping on a Starbucks PSL while sitting on a leaf-covered park bench in a cozy sweater? Not much. You know who else loves fall? Meeka! My pup and I just love getting outside during September and October. She loves going on walks and smelling the crisp autumn air while I love taking pictures of her in ridiculous halloween costumes (don’t judge, you know we all do it!). 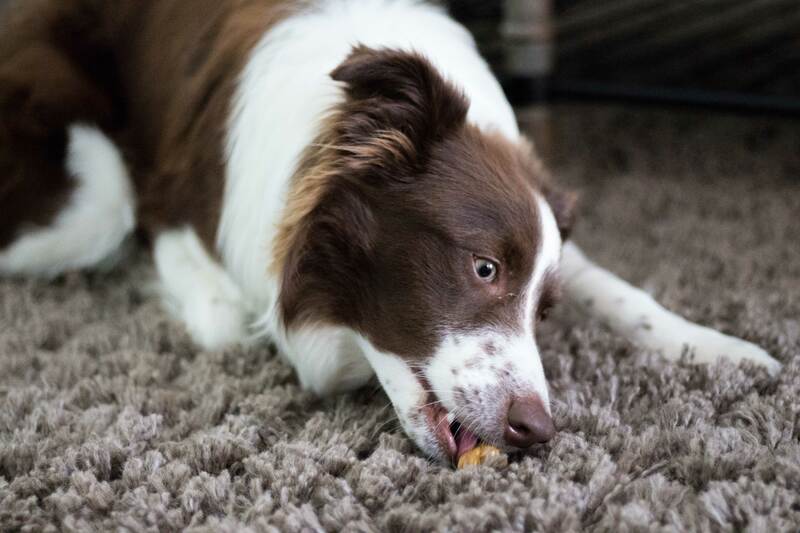 And it’s not just me who is a pumpkin-fanatic… Meeka loves this fall delicacy too! If you weren’t already aware, pumpkin is totally OK for dogs to eat. In fact, it can actually provide some health benefits for your pup. If your dog has an upset stomach, a spoonful of pure pumpkin puree (NOT pumpkin pie filling. 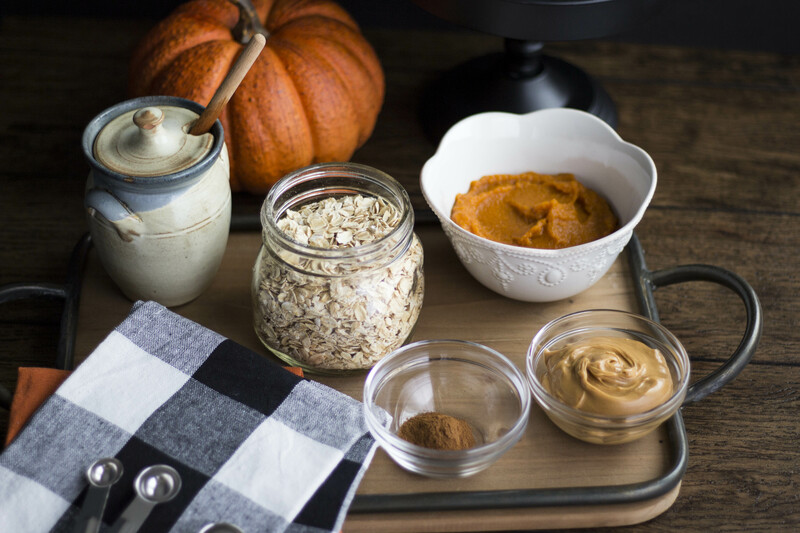 Pumpkin pie filling has loads of sugar and artificial ingredients that can be harmful to dogs. Pumpkin puree has one ingredient: pumpkin!) may be the trick to helping them feel better. Also, if you ever walk down the dog aisle at your neighborhood grocery or pet store in autumn, you’ll notice a variety of treats all claiming to be pumpkin-flavored. It’s so great that Fido gets to participate in all of the fall and pumpkin celebrations! But you know what’s even better than buying them a bag of those pumpkin-flavored biscuits? Making some homemade ones yourself! 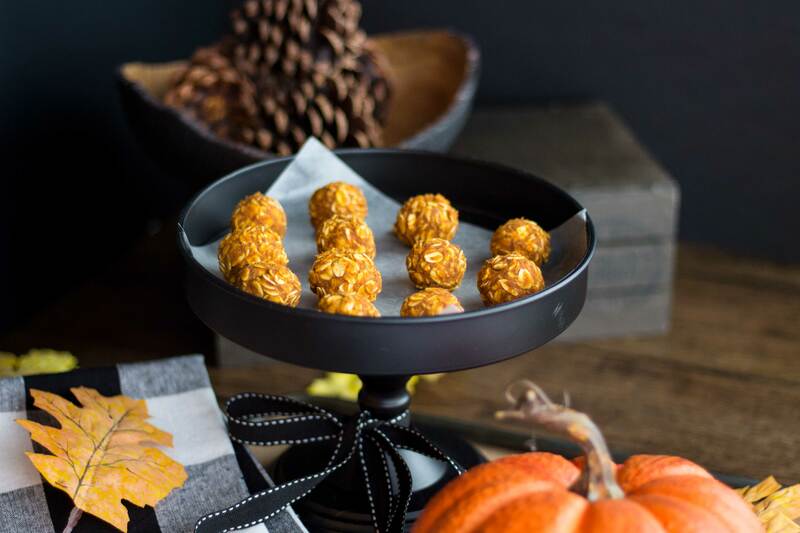 We present to you: pumpkin spice dog truffle treats! 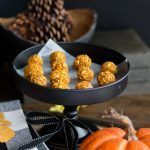 These treats are made with just a few simple ingredients and are no-bake (which, let’s be honest, is the best thing since sliced bread). 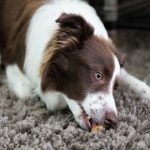 They have pumpkin, oats, cinnamon AND peanut butter… all of Meeka’s favorite things in one yummy bite! She’ll lick her lips like crazy everytime I grab these out of the fridge. Now that’s one happy (and spoiled) dog! I’ve also noticed that these treats give Meeka a good amount of energy. 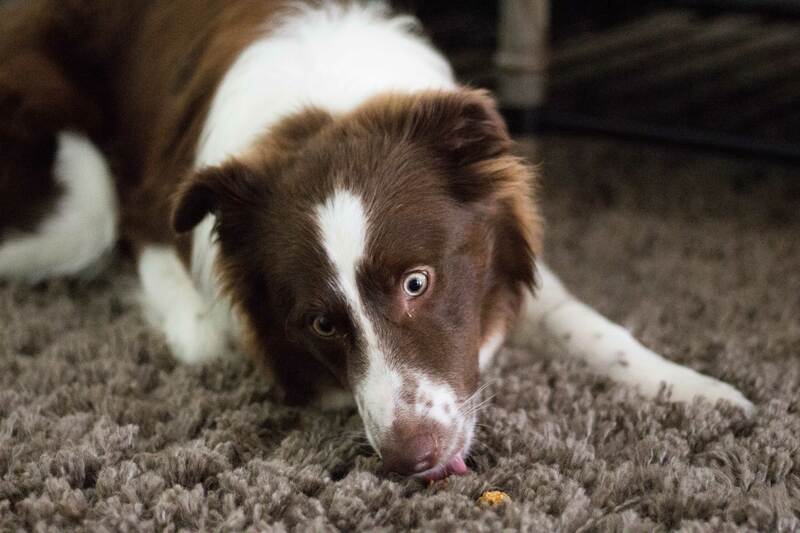 They’re loaded with oats and nutrition, so I always prepare myself for the zoomies after giving her one. Start by lining a baking sheet or tray with parchment paper. 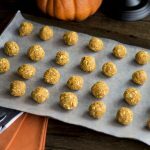 You will hopefully end up having around 20-30 balls at the end, so you may need two trays depending on how big you make them and how far you space them apart (remember: these are no bake treats, so you can pack them pretty tight together since you don’t have to worry about them spreading into each other). Set the prepared trays aside and roll up your sleeves, it’s time to get busy mixing! 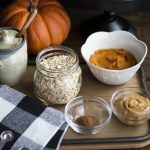 In a large bowl, combine the peanut butter, pumpkin, cinnamon and honey. Mix these ingredients together until they all fully get to know each other (AKA, everything is well incorporated). Next, pour in the oats and gently fold them into the wet batter. Test a ball by grabbing a tablespoon-sized clump and rolling it around in your hands. You should be able to roll and shape it fairly easily without too much of a mess. 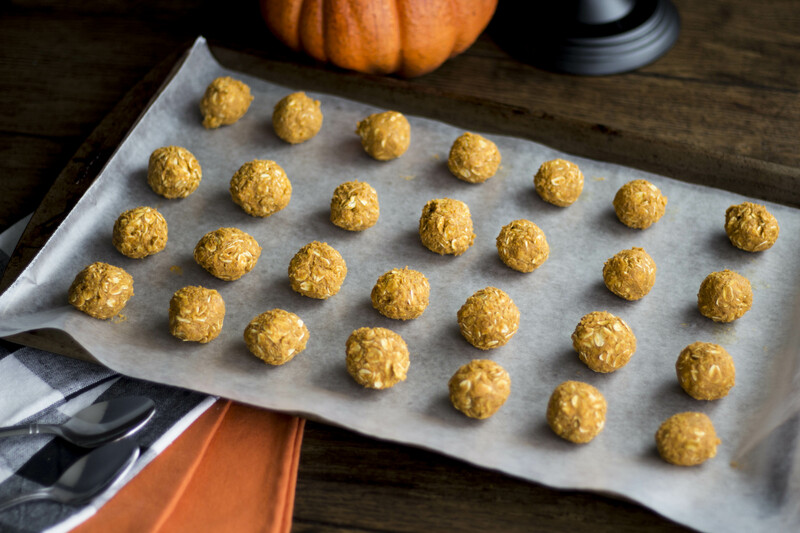 If the ball begins to fall apart, add ¼ cup more oats until it is easily managed and rolled. 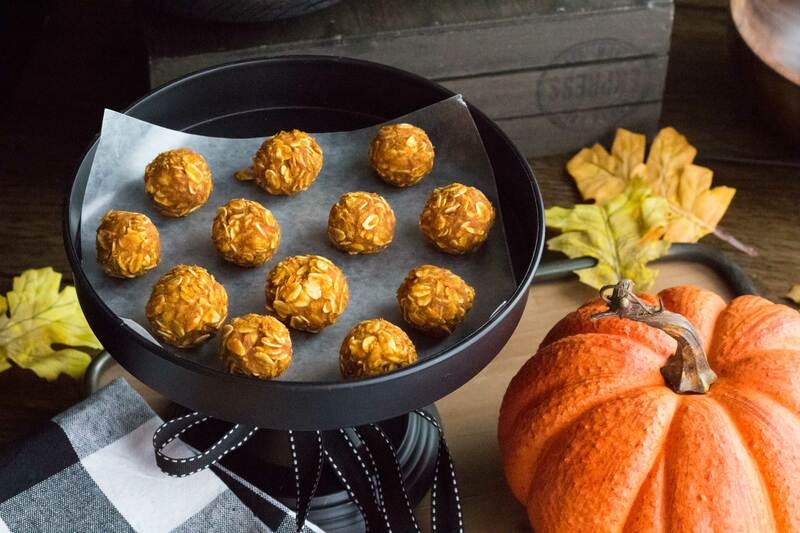 Once the batter reaches the right consistency it’s time to roll out those treats! I recommend making each one a little smaller than a golf ball and placing them pretty close together on the parchment-lined pan. 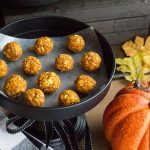 I was able to get a good amount of treats out of my batch and I even ended up getting them all to fit on one pan (now that’s some serious skill!). Once your truffle treats are all rolled out and lined up, transfer your baking sheet to the fridge and let them cool for 2 hours or overnight (the longer they sit, the more firm and better they will be). When you remove them from the fridge, give one to Fido for quality assurance (Meeka is so glad I included that part in the instructions) and package the rest up in an air-tight container. Keep them stored in the fridge for up to 3 weeks or you can even freeze them and keep them good for up to 3 months. Side note: Meeka likes to eat them all in one bite, which I’m OK with since she is a bigger dog and the treats are soft. 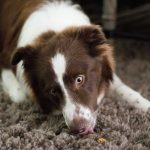 But if you’re worried about your pup choking, consider rolling them into smaller balls or break them apart before feeding to your hungry dog. This makes eating a little safer and gives you more peace of mind! Did you try out this recipe? How did it go? Did your dog like them? Please let us know! Do you have any fun fall baking traditions? Tell us about them in the comments for a chance to be featured!